Colm De Bhailís (Wallace), the poet, who lived in the Workhouse in Oughterard would have died unrecognised only for the attention paid to his welfare by Patrick Pearse and Eamon de Valera. The Gaelic League thought that an educated person such as Colm should not be in a Workhouse so they procured lodgings for him with the O Toole family, Main Street, Oughterard. He lived until he was 110 and he was buried in Kilcummin cemetery. 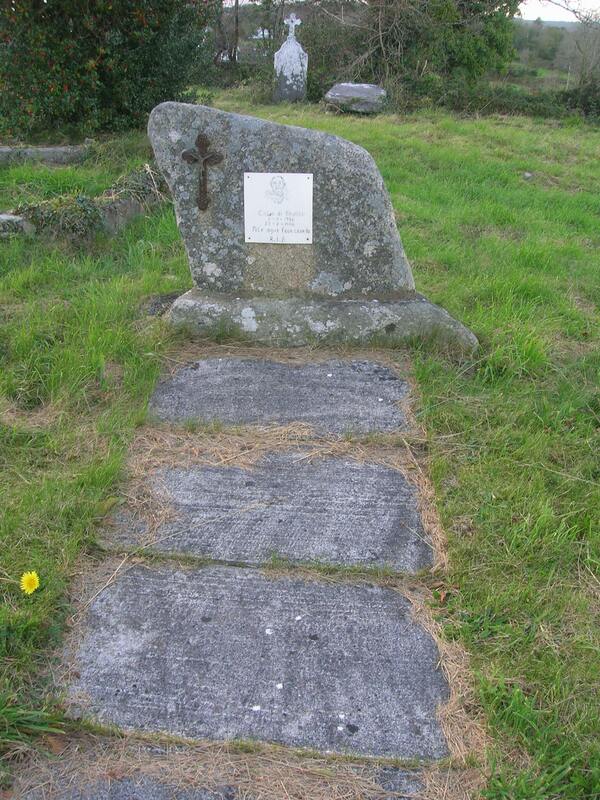 His grave was unmarked until the late Pat Gibbons, Main St. Oughterard pointed it out. A headstone was erected over the grave bearing the above inscription. His works were published by Connradh na Gaelige. “Tacar Amhrán” a collection of poetry by Padraic Ó Domhnalláin, a local teacher, contains a poem “Amhrán an Tae” by Colum Wallace. This book was in use in local National schools at the beginning of the century. Eamon De Valera and Padraic Pearse stayed with Padraic Ò Domhnalláin in Camp Street when they came to visit Colum Wallace. De Valera at that time used to attend Irish courses in Tourmakeady. Padraic Pearse wrote several letters to Padraic Ó Domhnalláin. Seán Donnellan National school teacher, son of Padraic Ó Domhnalláin, gave me a copy of the letters. 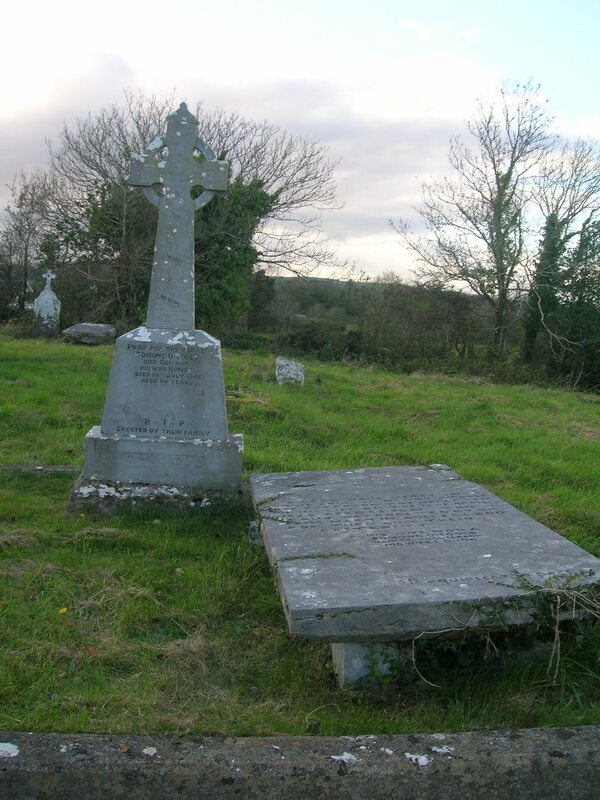 Colm De Bailís lodged with Harry O Toole and his wife Nora who are buried opposite the Republican Plot with their children Tommie, Mary, Seamus and Laurence who died after contacting the flu in 1914. The children’s names are not listed on the headstone. Beside this is the family grave of Harry and Nora’s other children, CHRISTINA (Chris), HENRY(Henny), EDWARD(Ned) and WINIFRED CAINE. Their son JOHN is buried with his wife KATHLEEN nearby. Many more of our headstones have interesting stories connected with them. Mary Naughton is recorded as being buried here in 1978. Has anybody seen her grave please? I am looking for information about Henry Joseph O’Toole, my grandfather, who is from Oughterard, was born in the late 1800’s and emigrated to Pittsburgh, PA around 1910 or so. He married Delia Lydon in Pittsburgh in 1919 and she was originally from Spiddal. this project is wonderful. I am searching for Martin Naughton, born 1835, of Outhterard. Are these tombstone inscriptions on a searchable site? thank you.